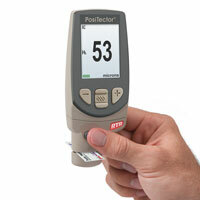 The Positector 6000 Series Coating Thickness Gauge is the industry standard in precision and reliability. 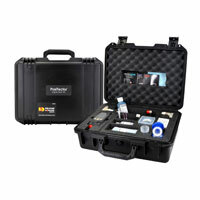 Rugged, fully electronic coating thickness gages use magnetic and eddy current principles to measure coating thickness on both ferrous and non-ferrous metals, accurately and quickly. 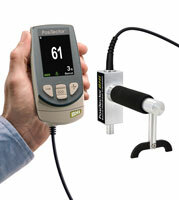 Coating Thickness Gauge with Micro Probe for measuring thin coatings and small parts with hard-to-reach areas. 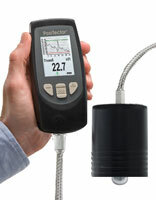 Coating thickness gauge for measuring thick coatings on ferrous metal substrates. Ideal for thick polyurea, intumescent fireproofing, insulating pipe coatings, rubber , roofing and more. In Duplex mode, the PosiTector 6000 FNDS utilizes both magnetic (ferrous) and eddy current (non-ferrous) principles simultaneously to calculate and display the individual paint and zinc layer thicknesses. 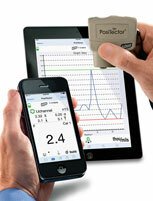 Wirelessly connect PosiTector probes to smart devices wit the Positector SmartLink. 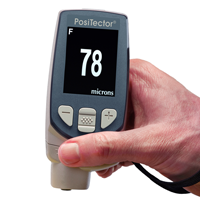 The PosiTector gauge body accepts all PosiTector 6000, 200, DPM, UTG, RTR and SPG probes allowing it function as a coating thickness gauge, dew point meter, surface profile gauge or wall thickness gauge. 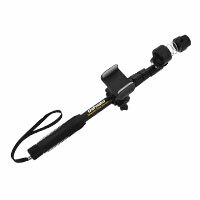 Coating Thickness Gauge with extended waterproof probes for under water measurement.